I’m a little late writing up a report from Dawn to Dusk 2015. Maybe I still can’t believe how amazing the weather was. 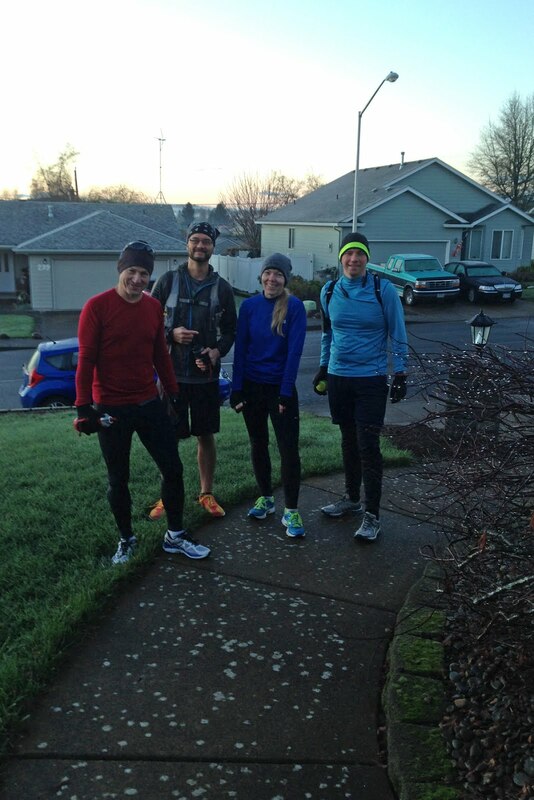 When you plan an event for the shortest day of the year, in Oregon, you expect bad weather. During the 4 years that I have been doing this, Oregon has not disappointed. And then, in the middle of the wettest December in recent history, one beautiful sunny day like a reverse oasis appears. 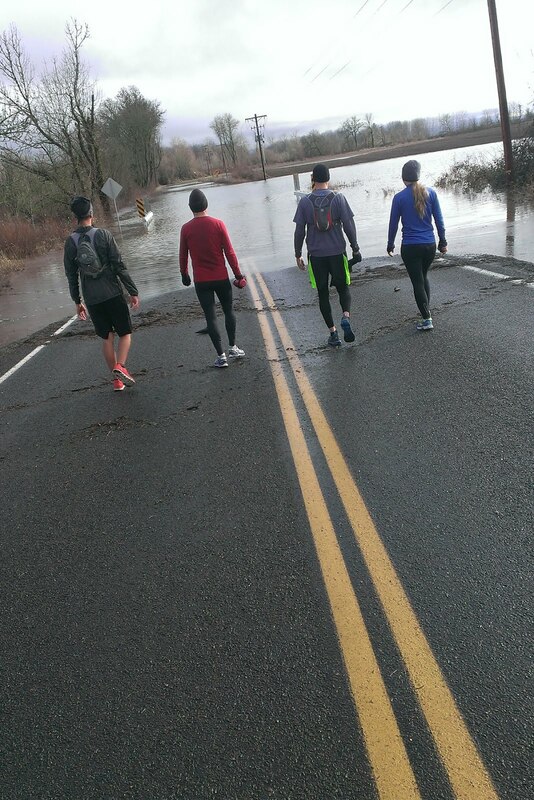 7:47 started with 4 runners, Kim, Bo, Eric and myself. Making our way through and out of Dallas, conversations wandered all over, occasionally interrupted with exclamations that the pace was way too fast. 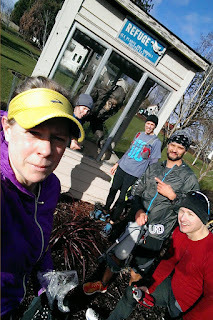 We talked about fast food marketing, community theater, homemade energy gels and of course, how perfect the weather was. Low 40’s, sunny and dry. 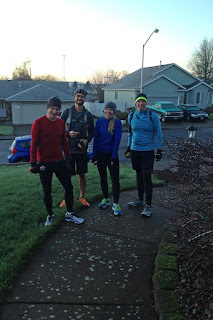 Mile 11.5 brought us into Independence, where we met up with Jerry and Julie. They had brought drop bags for me, Kim and Bo. Well, they brought a drop bag for me and Kim. Bo packed a little more that would could be described as a bag. The upside to Bo’s enthusiastic planning was we all knew that none of us were going hungry! Eric got picked up about a mile later and the five of us headed toward the Buena Vista Ferry. Well, we aren't going that way. 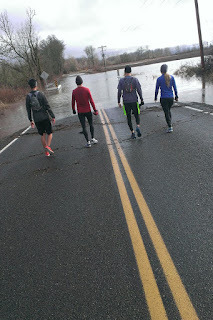 In the days leading up to Dawn to Dusk, Bo and I had discussed the possibility of roads being flooded out, so I had it in my mind that routes might need to be altered and, sure enough, the road out to the ferry was completely flooded. We changed our route to the much hillier Old Corvallis Hwy, eventually turning around at a statue of a Sasquatch. When I viewed our route on a map, I also learned that the house with the Sasquatch in front of it is also a coffee shop called Buddha2go. I love Oregon. We had been straight into a pretty chilly 10 to 15 MPH wind on the way out and it was nice to have that wind at our back heading back toward Independence. Independence was the end of the road for Kim and Bo (28.5 miles) and Jerry and Julie (17 ish miles) and meant I had 6 miles on my own before anybody else was to join me. I ate some mixed nuts and took a few drinks of Coke, refilled my bottle with Infinit, made a bathroom stop and then, I was all by myself. Looking West, the direction I was headed, the gorgeous weather was coming to an end. Dark clouds were in front of me and I hit my only low moment of the day. I usually have a little dip in attitude right after eating. I’ve been working on this for years, but it still persists. I was cold, 29 miles tired and it was starting to rain. I called Jeanne and asked her to send a rain shell along with Mindy and Betsy, who would be joining me at mile 34. Still I had 5 wet, cold miles to get to that point. A sign of better miles ahead. Shuffling along and feeling sorry for myself around mile 32, I looked up and there were Mindy and Betsy pulled over on the side of the road and Mindy was jumping out with my jacket. I faked good spirits, said I was glad to see them, which I was, and put on the jacket. I told them I’d see them in a few miles and they were off. I probably didn’t run for more than a few minutes with the jacket on before the sun came out, introducing an amazing rainbow and suddenly, I was fine. The jacket came off, my mood was better and I felt really good from that point to the end of the day. Mindy and Betsy were waiting for me at my mile 34. Jeanne was hanging out with, an almost walking Lucas, so that Mindy could run the last 6 in with me. I had planned a 40 mile route, and made provisions for bonus miles in case we finished early. In my rough draft of the day, I had hoped to hit 40 miles at 4:00 PM and then make a decision about what to do with the remaining 33 minutes. We hit 40 miles at 3:58. 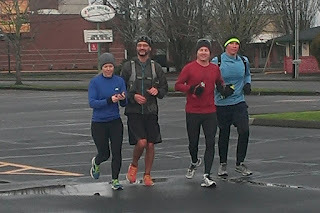 Had I planned a 43 mile route, I’m certain I could have made 43, maybe even 44, but cold and wet and with a warm house, good friends and a hot pot of chili on the stove, I decided 40 miles was enough and opted for a hot shower.